The time has come to recover legitimacy, sir leader and sons, also for dismantling of all our prisoners from the dark prisons. Les unexpected war would encompass the world. expressing the desire for broader cooperation with Libya can take advantage of the Moroccan expertise in restoring and building the ‘modern’ (WESTERN-PUPPET) Libyan state stage. ‘Daash’ bombing will not be delayed. And the battle of Tripoli bloody militias on the doors. The scene (destruction and the displacement of blood) will reach fragments homeland map. And the city of the statement but refuses to renew the statement shed innocent blood. and sends the Spirit in Libya again after that Ostaos combination. The new era was just wishful thinking combines (elite homeand and the balance of the world and the awareness of the crowds and the awakening of the nation and the fall of the demons of employment). And tomorrow promising title (compelling argument and the presence of a remarkable and outstanding success and leadership wise). Not astrology but to read the data paint a future addresses and profiles. Bushra patient that God promised the slaves always open Matkon shown great joy. Separation of the two stages where the battle ends with filth and Tood where sedition and win the right. It works; it happened stationed in silence and prepare him honest patiently will have increased to Aanill of wisdom and glory. But the shock die hated them and repent al-Amadhok where they will be increasing their lessons. The event Sakhrs tongues of Satan and employment fall leaves and confuse the West shocked the loss of leadership and gives motivation for the Middle sense about leadership. About (so-called) ‘moderate’ Islam (which just wipes confusion and distortion). Arabism and rising re-gloss identity. And dewy metropolis impose themselves in tongues Titans era. The universal language of new high-concentration even for Aasagt someone inadvertently or deliberately exceed last. And calculation of the punishment and sorrow and remorse and compensation between the killer and the killed and between the oppressor and the oppressed. Towards a new horizon with the experiment. And the structure of the responsibility of the various sacrifices. And the values ​​of a noble product of suffering a fall. Strict laws and the extent of awareness and understanding. Lying fell. And fell to the mask. The client and fell. Maadzt him and check all the security committees, control and cleansing. Rose awareness. Check immunization. Check insurance. And check unless you inform him of setting curriculum and education courses. We discovered defects. We discovered errors. We discovered deficiencies. And become whiter and clear the way attractions. We knew the enemy. Friends knew. We knew al-Mzbzban. Ochtsrna maneuvers and build relationships and alliances. Blessed are those chosen for him Rafik prophets and saints. Medals and glory to the issuance of the catch on the right Kaljmr his hands in the lean years. And a proud history and a bright tomorrow’s generations inherit. The date on the horizon will not be repeated in the life of each of the sphincter. It will enter the conquerors of the four doors. The leading Bilal Altaorga Jerusalem mosque to be authorized in people. West deceitful and only care about their interests, says it does not recognize the government of Tripoli; however they send Libyan currency containers to Mitigua Airport, where-is the main stronghold for Wahhabi-terrorism in the capital. “The money that the aircraft landed in MITIGUA, will be borne bulldozers to support terrorism in Benghazi. The Muslim Brotherhood steal power as thieves steal money and Atkhasamun on the sharing just as happens with thieves in sharing what steal money from. Two killed following, militia manatee Anzourautam shut down the coastal road and a charged situation there. Activating the gate, with ‘arms medium’, the Brotherhood Misurata militias, have affiliated themselves to the clinic near the ‘wellness area’ of Palace Bin Ghashir. Militias, Salah al-Mirghani arrested one of Egyptian identity in the ‘wellness area of Mulberry’, after smelting Salah Mirghani claimed to kill some Misurati in Qasr bin Ghashir. Father of his car and kidnapped his daughter on the road to Ain Zara, Tripoli. And the theft of climate predictions screens and break into some offices and stealing their printers. Close by al-Qoaah (East al-Qervolla) on the back of winning the tension between the militias of Misurata and Tajourah. The arrival of the Libyan Red Crescent delegation of the Tripoli branch to Zintan International Airport, to receive the shipment of medicines and medical supplies by the Libyan Red Crescent branch B.al-Zintan. This shipment dedicated to ‘Children’s Hospital’ and the evacuation of a ‘maternity hospital’ in Tripoli. This shipment of medicines and medical supplies, was provided by the ‘People’s Government of China’, through the Libyan Embassy in Tunis, Tunisia. The actual opening of the ‘private physiotherapy center for the wounded’, where they were set up and equip this center by the ‘Zintan Military Council’, in cooperation with the maintenance department and processing ‘General Hospital Zintan’, and is dedicated to the cases of war-wounded. As God willing, it will be opened during the coming period minority psychological support center for people living in the war. Zintan Airport Security Center frustrates baby smuggling operation! The evening 11/24/2015 in ‘Zintan airport’ and during internal flight procedures (Zintan al-Obrq) Capture Hkhadd, who carries the baby in a bag, after suspecting him, and had been received for the center communiqué circulated in ports, on the person kidnapped his baby out of the house his wife’s family after he broke into the house as a result of a dispute between him and his wife in Tripoli, and have been reported since the loss of the baby several days. After the reservation to the suspect, and the opening minutes of the incident shows that the man was kidnapped baby aged two months after they broke into his wife’s family home of one of the windows, and escape the infant and disappearing from sight, and tried later smuggled to the eastern region through the ‘Zintan airport’. And immediately contacted the baby’s mother to pick it up and give a chance to resolve the matter in a friendly family way. Directorates support the security of the western region and the southern power of the Commission, “the 200”. Located within the ‘headquarters of the force’, who recognizes the true owner, has put us with the possibility that re-painting was not done by her… No. Room Zintan operations a ajouté 4 nouvelles photos. reports of many injuries ! 7 dead, 5 wounded. Statistical preliminary names of the number of victims of the bombing which happened in the Msalatta gate this morning, at gate Msallata. Statistical initial cases that have been recorded in the ‘City of Five hospital of Education’, resulting from the bombing that targeted the security point (‘gate Msallata’ of the ‘Military Police’). -5 Ali Mohamed Oboagafh, 22 years. Osman al-Hamaja: 55 years / native of City of Five. Abdul Latif Salem Ramadan: 37 years / native of Tripoli. Khalid Abdullah: 37 / native of City of Five at Celine. Fatima Amgeor well: 52 / native of City of Five. Hmida Fetouri Ashour: 32 / native of City of Five. Ahmed Mohamed seas: 46 / Palace of the good guys. Cases ranging between light, medium .. and there is a situation in Intensive Care “concentrated”. Organization of ‘Daash’, mandate of Tripoli, adopts the car bombing of the City of Five area. Areas of the island are experiencing Ghiran uprising ! airbrush and writings by Ibrahim al-Jdharan, entitled “Conference fall Brotherhood client”, is stirring-up the heat for a revolt. Airliner flight anonymous low to high in the sky Akaddahih area, west of the city of Sirte. “Planes loaded with weapons to support the dignity troops landing in Kherobp Airport, the nearest point to the headquarters of Hftar. Security alert and a large gates to the Brotherhood militias of Misurata after news about ‘Daash’ controlling the gate, and their military link between al-Heisha, Jufra. Achtbaakat between Tabou and Tuareg and the fall of the rocket-propelled grenades on the project area and initial news reports of the fall of the dead Tabou. “agreement between the Tabou and Tuareg in the swine barn message for Egypt and the UAE that the Doha pigs still have influence in Libya, while the parties to the agreement understand Kmbars in silly play, no one wants to see them anymore. Claims of sovereignty in Libya does not apply the principle of reciprocity in international relations while applied by militias in the relationship between them. America Announces sending in U.S. troops to Syria under the pretext of organizing the moderate opposition forces in the face of ‘Daash’. (America wants to secure locations for Aitalha Russian bombardment so long scheme and Aahakq Russians shutout and fast). and especially with the increasing Russian provocation hacked Turkish airspace closure radar Turkish fighter jets, and the flight of an Iranian airline with Russian fighter jets). French newspaper ‘Evgarwa’, says that France paid for the withdrawal of the United States from the scene (otherwise messages to U.S. from the French, may make the international coalition [led by the United States] almost fragile, without the European countries of the Eastern bloc). U.S. made an agreement for the Turkish closure of the border between Turkey and Syria, on the solemn pledge that the U.S. will not establish any base in the area where the Kurdish have established self-rule, in the north of Syria. Request the presence of the so-called ‘moderate opposition’ in a Vienna dialogue (the Western Camp, and the forced trio behind them, being Devils Qatar, Saudi Arabia and the UAE, to create a ‘new name’ to come out the previous regulations, of its defeat and be recognized in the talks). Putin visited Iran, and met with Imam Khamenei, with a spiritually strong message*); because, the strong relations and efforts standardized files region of Yemen, Iraq, Syria and Lebanon on the table, causing chronic headaches, will chase the ‘occupational donkey Gulf idiots’, and minors, for understanding international changes... and who will be the victim of any adventures or settlements). *:After meeting with Revolution’s Leader, Mr. Putin presented one of oldest Holy Quran manuscripts to Ayatollah Khamenei. Turkey shoots down Russian warplane in skies over northern Syria known to Turks as the ‘Turkmen Mountains’……One PILOT was shot-down by ‘Turkish al-Mstiv Daash’. Syrian commandos rescued his co-pilot, Moscow announced Wednesday after a 12-hour operation. Russian Defense Minister Sergei Shoigu said Wednesday that the Russian forces that rescued the pilot will receive decorations and that the Su-24’s deceased copilot will receive the Hero of Russia medal. Syrian rebels destroyed a downed Russian Mi-8 helicopter with a U.S.-supplied TOW missile in the hours after the shootdown, and have the video to prove it, which FP’s Henry Johnson, promptly posted. The helo was brought down by small arms fire, Russian officials said on Tuesday, and made an emergency landing while looking for the downed Russian pilots. A Russian marine was killed in the incident. Once on the ground, and with the crew evacuated, Syrian rebels blasted the bird with the TOW for good measure. The Russian Ministry of Defense has already started to move. By Tuesday afternoon Moscow had severed all military-to-military contact with Turkey, moved the Moskva, a guided missile cruiser with anti-aircraft capabilities, closer to the Syrian coast to protect Russian warplanes, and announced that all Russian bombers flying over Syria will be accompanied by fighter planes to protect them from similar incidents, writes ‘Foreign Policy’’s Paul McLeary. In addition, Russia will send its most advanced air defense system, the S-400, to Syria. The presidency of the Russian General Staff announced on Tuesday that Moscow decided to cut off all military contacts with Turkey. Chiefs of Staff and vowed to shoot down any aircraft penetrate the Russian border and pose a threat to its soldiers there. She said the presidency of the Russian General Staff, that the system “Fort” air defense will be posted near Latakia on board the cruiser Moscow, and will destroy any target poses a threat to Russian aviation. Ceylan Yeginsu reported from Istanbul, and Neil MacFarquhar from Moscow. Ivan Nechepurenko contributed reporting from Moscow. Turkish fighter jets on patrol near the Syrian border on Tuesday shot down a Russian warplane which Turkey ‘claimed’ had violated its airspace, resulting in a long-feared escalation that could further strain relations between Russia and the West. In his first remarks on the incident, President Vladimir V. Putin of Russia confirmed that an ‘F-16 Turkish fighter-jet’ shot down the Russian jet, a Sukhoi SU-24, with an air-to-air missile. But he insisted that the Russian jet had been in Syrian airspace all the time, and had never once even threatened Turkey’s territory. Mr. Putin, speaking slowly and clearly angry before a meeting with King Abdullah II of Jordan in Sochi, Russia, said the episode would have “serious consequences for Russian-Turkish relations” but did not elaborate. He called the downing of the Russian fighter a “stab in the back” by those who “abet” terrorism, and he accused Turkey of aiding the ‘Islamic State’ by helping it sell its oil. Mr. Putin said he found it suspicious that Turkey had reached out to its NATO allies after the episode but not to Moscow. He nevertheless insisted the situation should encourage more cooperation in the fight against terrorism. As Mr. Putin spoke, credible reports were emerging from rebel forces in Latakia Province, where the Russian jet went down, that rebels possibly wielding TOW antitank missiles and other weapons had shot down a Russian helicopter sent to the scene of the crash to look for survivors. There was no official confirmation from Russia, and state-run television news cited only foreign reports. The Russian Ministry of Defense confirmed that one of its jets was shot down, but claims that “the aircraft was flying only within the borders of the Syrian territory.” Video footage shows the Russian Su-24 jet falling to the ground in flames, with two parachutes clearly visible. An early report from the AP, says at least one of the pilots was found dead, after an insurgent group in Syria claimed its fighters fired at the pilots as they descended. The Russian military said that the plane’s two pilots had ejected, and another video published by the semiofficial news service ‘Anadolu Agency’, showed two figures parachuting from the aircraft. Video footage emerged soon thereafter showing one bloody pilot on the ground surrounded by radical-insurgent anti-Assad mercenaries and Kharijites exulting at his death. Shadi al-Ouwayni, a (so-called) ‘activist’ in rural Latakia Province, said one pilot was shot as he drifted to the ground in his parachute while the other was captured by a local militia called ‘the 10th Brigade’. The pilots landed in different, but rebel-controlled, locations, he said. “It was stressed that the Russian side’s actions were not a fight against terror, but they bombed civilian Turkmen villages and this could lead to serious consequences,” the statement said. Ankara has long called for the protection of Turkmens, who are of Turkish descent, in Syria. The incident realizes one of the early fears about the close proximity of NATO and Russian warplanes operating in Syria, ever since Russia deployed its jets to the country in September. This stands as the most serious incident between Russia and a NATO nation in recent memory. The incident comes at a moment of increasing tensions between Turkey and Russia, just days after Ankara summoned the Russian ambassador, Andrey G. Karlov, to complain over the bombing of Turkmen villages in northern Syria and Russian military action close to the Turkish border. Russia’s Foreign Minister Sergey Lavrov was already scheduled to travel to Turkey on Wednesday for talks. The Russian defense ministry and the state-funded news network RT claim that two RT reporters, Roman Kosarev and Sargon Hadaya, were injured by a TOW anti-tank missile aimed at their vehicle while traveling near the village of Al-Dagmashliya in Latakia, close to the Turkish border. Russia’s defense ministry says both reporters are now safely back at a Russian airbase in Latakia receiving treatment for their injuries. But the warplane incident is likely to further sour relations between two central parties to any solution, Moscow and Ankara, already bruised over previous tensions on the border and differences over the fate of President Bashar al-Assad of Syria. The Kremlin sent its military to Syria in late September to shore up Mr. Assad and to fight rebels backed by Turkey. The Russian foreign minister, Sergey V. Lavrov, canceled a trip to Turkey for meetings on Wednesday, more proof that “Russia-Turkey relations will drop below zero,” as Ivan Konovalov, director of the Center for Strategic Trends Studies, said on the state-run Rossiya 24 cable news channel. “I think all actors, namely the U.S., Russia and Turkey, must know very well that such a crisis would only help ISIS,” Ms. Ozer added, in a reference to the Islamic State. Last month, Turkey shot down an unmanned aerial device that analysts said was likely of Russian origin. In Tuesday’s incident, television footage shown on the privately owned Turkish channel ‘Haberturk’ showed a warplane exploding in the air and tumbling down in flames in a wooded area, identified by the broadcaster as a region of northern Syria known to Turks as the Turkmen Mountains. Russia’s entry into the heavily trafficked skies around Syria in September raised immediate concerns about mishaps, inadvertent or otherwise, that could lead to confrontations involving Turkey, a NATO member, and the United States. The U.S. is very closely allied to Ankara. The U.S. (who is covertly supporting ISIL/ DAASH) employed its soldiers from the ‘U.S. Army’s 10th Special Forces Group’, having quietly arrived in Ukraine, to begin training a Ukrainian Special Operations battalion, a Pentagon spokesperson has confirmed to ‘SitRep’. The deployment comes as part of a larger U.S. effort to train the Western-puppet-Ukrainian military for their fight against Russian-backed ‘rebels’ and concerned Ukraine civilians (who are against the newly installed Western-puppet regime) and Russian troops in the country’s east. Soldiers from the American ‘173rd Airborne Brigade’ are already training several battalions of of soldiers. Washington has committed more than million in equipment and training since 2014. Training of the troops will be conducted at the Yavoriv training center in far western Ukraine, while the special operations piece will take place at the Khmelnitsky facility, also in western Ukraine. Turkey’s shooting down of a Russian fighter jet near the border between Syria and Turkey serves the interest of “sociopath” war hawks in Washington eager for a conflict with Moscow, an American writer and political analyst says. The downing of the war plane was a “very dangerous” escalation likely carried out with the authorization of NATO and Washington, said Daniel Patrick Welch, an outspoken critic of US foreign policy. “It all winds up being in the service of the sociopaths in Washington, who for some crazy reason, are spoiling for a fight with Russia, Welch told Press TV on Tuesday. On Tuesday, NATO member Turkey shot down a Russian fighter jet, claiming the aircraft had repeatedly violated its air space. “There is no one there to talk to, that they will always be stabbed in the back, like Putin said today, and that the drive toward separation, and integration with BRICS, with China, etc, has to be accelerated on all fronts” the analyst said. 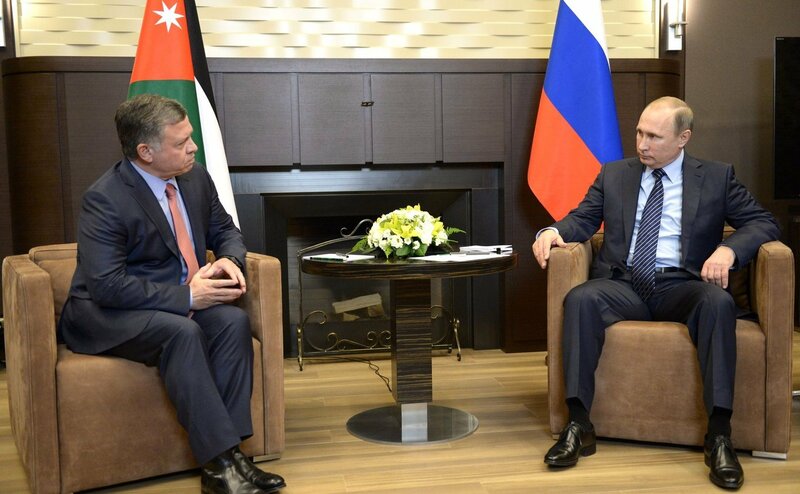 Vladimir Putin had talks with King Abdullah II bin Al-Hussein of the Hashemite Kingdom of Jordan, who is in Russia on a working visit. Below is the transcript of a recent meeting between both leaders. At the outset of this meeting, the issue of the Russian Jet Fighter attacked by Turkey was raised. President of Russia Vladimir Putin: Your Majesty, it gives me great pleasure to welcome you to Russia. We maintain constant contacts with you. Today, when there is such a serious struggle against international terrorism, it is obvious that we must join our efforts. I am happy to state that our military and official services are working in this direction. Apart from that, we have other matters to discuss – I am referring to our bilateral relations. King Abdullah II of Jordan: My dear brother, I thank you very much for seeing me today, on a day when you have many weighty issues on your shoulders. I would like to offer my condolences and those of the Jordanian people for that tragic terrorist heinous attack on the innocent Russians that lost their lives through the Metrojet terrorist attack, as well as the loss of your pilot today. I believe that this compels the international community to work stronger together both militarily and diplomatically in the context of Vienna, which is something that you have been a strong sponsor of. You know, Mr President, I have said for many years that the only way of finding a political solution in Syria is with the strong role that both you and Russia play for a political solution for the Syrian people. Your fight against ‘Daash’ is a fight that all of us have to do together not only in Syria and Iraq but also both you and I have said that this a global war, a war that binds all of us together. ‘Daash’, al Qaeda and their offshoots want this to be a fight against humanity. And you and I have both hoped for many years about the holistic nature of this challenge — how we have to combine international efforts not only in our region but to fight this in Africa, in Asia, in Europe as well as our region. So these are not only the challenges we face in Syria and Iraq, but also we have seen terrorism in Saudi Arabia, in Beirut, and unfortunately recently in Paris as well as Mali. I know that this is a fight that both you and I, our countries and many others in the world are determined to win. Again, this is an opportunity for all of us in the international community to come together and fight this fight as part of a coordinated international body. I again commend the very strong relationship between our two countries and between you and myself. I have known you for many years and our relationship has always been a strong one, and I know that it will continue to move from strength to strength. I thank you for the valuable time that you have given me today on a very difficult day for you and for your people. Russia has been conducting airstrikes on ‘Daash’ positions at the request of the Syrian government since 30 September 2015. Russia’s airstrikes in Syria mean Russian and NATO planes have been conducting an air campaign in the same air space for the first time since World War II. Syria has been gripped by deadly violence since March 2011. The United States and its regional allies – especially Qatar, Saudi Arabia and Turkey – have been supporting the militants operating inside Syria since the beginning of the crisis. ISIL terrorists, who were initially trained by the CIA in Jordan in 2012 to destabilize the Syrian government, have taken over swaths of land in Syria and Iraq. The Takfiri group has claimed responsibility for the attacks in Parris, France earlier this month that allegedly killed 130 people. Islamic countries must boost ties against this dangerous enemy in order to protect their identity and interests. – Investing hope in cooperation and aids from US and west in fight against terrorist movements like ‘DAASH’ or ‘Boko Haram’ is erroneous. – Based on accurate data, Americans and some reactionary countries in region are directly supporting ‘DAASH’ and play a destructive role in Iraq. – Iran has extensive relations with all states but US and Zionist regime; we believe that Islamic countries must have much closer ties. آقای «قربان‌قلی بردی محمد اف» رئیس جمهور ترکمنستان عصر امروز (یکشنبه) با رهبر انقلاب دیدار کرد. “- Iran, Turkmenistan common borders have been peaceful and source of calmness, convenience for both sides. یکى از این عواملى که نظام ارزشى غرب را و سلطه‌ى معنوى این نظام را متزلزل کرده، بحران رو به افزایش اخلاقى و معنوى در غرب است؛ که نشانه‌ى بارز آن رواج احساس پوچى، احساس بیهودگى، احساس ناامنى روحى در بین آحاد مردم – بخصوص در بین جوانها – در غرب است. تلاشىِ خانواده؛ بنیان خانواده در غرب دچار تزلزل شدید است و متلاشى شده که این آثار را میگذارد. Venezuelan president, H. E. Nicolás Maduro, met with Leader of the Islamic Revolution minutes ago. – U.S. considered Latin America as its backyard, but Venezuelan unique movement gave region independence and identity. – Wars in today world are in fact “war of wills” and you can conquer difficulties through resistance, strong will and use of vast capacities of your own country. – Imam Khomenei managed to topple a regime backed by US and Europe with bare hands and with the help of nation he encouraged, and this prescription is the way to victory and persistent success of independent states. – Iran sees progress and success of Venezuela as its own. آقای نیکلاس مادورو رئیس‌جمهور ونزوئلا صبح امروز (دوشنبه) با رهبر انقلاب دیدار کرد. THE ISRAELI MILITARY WENT AGAIN ON A RAMPAGE AGAINST THE GHETTOIZED PEOPLE IN THE GAZA STRIP. THE LAST TIME, THEY “VISITED” THE WALLED-IN STRIP AT THE TURN OF THE YEAR 2008/09, THEY SLAUGHTERED 1 400 PALESTINIANS. IN 2014, THEY KILLED OVER 2 100 PALESTINIANS, 80 PER CENT CIVILIANS, INJURED OVER 10 000, MADE OVER 300 000 HOMELESS AND RAVAGED THE INFRASTRUCTURE. ISRAEL’S PATRON, THE US EMPIRE, DID NOT LIFT A FINGER IN 2008/09; NEITHER DID IT THIS TIME. THIS ONE-SIDED RELATIONSHIP IS ANALYZED BY JAMES PETRAS, AN AWARD-WINNING AUTHOR AND PROFESSOR EMERITUS, IN A GLOBAL GEOPOLITICAL PERSPECTIVE. MAINSTREAM MEDIA OUTLETS HAVE CENSORED THE COMMENTS MADE BY THE ARGENTINE PRESIDENT AT THE UNITED NATIONS GENERAL ASSEMBLY WHERE SHE HARSHLY CRITICIZED THE US INTERNATIONAL POLICIES. BUT WHAT ELSE IS NEW RIGHT ? ANYBODY WITH A BRAIN AND COMMON SENSE KNOWS ILLUMINATI JEW CENTRAL BANKERS HAVE CONCENTRATED UP ALL THE MAINSTREAM CORPORATE WESTERN MEDIA AND INFORMATION NETWORKS INTO THEIR TINY SATANIC HANDS ALL THE WHILE CONTINUING TO DISTORT OUR PERCEPTION OF SELF AND REALITY. During her speech before the United Nations 69th General Assembly on 24 September 2015, Argentina’s President Cristina Fernández de Kirchner covered a variety of issues from economic reforms needed at the International Monetary Fund to the plight of Palestinians and the global fight against terrorism. The Argentine president questioned countries such as the United States for attacking groups, including the ISIL Takfiri terrorists which Washington previously backed against the Syrian government. “WHERE DO ISIS (ISIL) AND AL-QAEDA TAKE THEIR GUNS FROM? YESTERDAY’S FREEDOM FIGHTERS ARE TODAY’S TERRORISTS,” CRISTINA FERNANDEZ SAID, BLASTING US POLICIES VIS-A-VIS TERRORISM. The ISIL terrorists, who were initially trained by the CIA in Jordan in 2012 to destabilize the Syrian government, control large parts of Syria’s northern territory. The group sent its members into neighboring Iraq in June and seized large parts of land there. The US and its allies recently launched airstrikes against ISIL terrorists in Iraq and later extended the aerial campaign to Syria. Fernandez also touched on judicial cooperation with Iran over the issue of the 1994 AMIA Jewish center bombing in the capital, Buenos Aires, and the political pressure that has been exerted on Argentina by the US and Israeli lobbies in that regard. Tehran and Buenos Aires signed a memorandum of understanding on January 27, 2013 to jointly probe the 1994 bombing of the Argentine Israelite Mutual Association (AMIA), which killed 85 people and wounded 300 others. The Argentine president dismissed the allegations against Iran concerning the 1994 deadly bomb attack. Under intense political pressure imposed by the US and Israel, (central bankers using their western debtor nations as bully’s to force weaker nations into going along with the NWO) Argentina had formally accused Iran of having carried out the bomb attack. Tehran has denied any involvement in the attacks and denounced accusations against Iranian citizens in connection with the blast as a false flag to screen the real perpetrators behind the bombing. THE WORD “SOLIPSISM” MEANS A SELF-CREATED REALITY THAT HAS LITTLE OR NO CONNECTION WITH TRUTH. THE WORD WAS COINED IN 1874 FROM THE LATIN SOLUS “ALONE” AND IPSE “SELF”. IT IS THE VIEW THAT SELF IS THE ONLY OBJECT OF REAL KNOWLEDGE OR THE ONLY THING THAT IS REAL. THE NEW WORLD ORDER IS DEDICATED TO REPLACING TRUTH WITH A SOLIPSISM CREATED BY THE SAME PEOPLE WHO CREATE MONEY FROM NOTHING AND CHARGE INTEREST. WHAT IS TRUTH? ON THE MATERIAL PLANE, IT IS THE NATURAL DESIGN, THE MOST EFFICACIOUS FUNCTIONING OF THE NATURAL REALM. ON A SPIRITUAL PLANE, IT IS ALLAH, WHO IS THE ULTIMATE REALITY, ANOTHER NAME FOR ‘ABSOLUTE TRUTH’, BEAUTY, LOVE, HARMONY AND JUSTICE, WHAT ALL HUMAN BEINGS NATURALLY CRAVE. OUR MISSION IS TO EMBODY THESE IDEALS. ON THE OTHER HAND, THE ‘NWO’ SAYS MAN IS ALREADY GOD. MAN EXCELS BY MANIFESTING HIS WORST QUALITIES WHICH SATANISTS THINK ARE HIS BEST. INSTEAD OF BEING DEDICATED TO TRUTH, HUMANITY HAS BEEN HIJACKED BY THE BANKERS. THE “NEW WORLD ORDER” IS A SOLIPSISM THAT STYMIES AND ENSLAVES MANKIND WHILE INCREASING THE BANKERS’ POWER AND WEALTH. SOMETIMES CALLED “SECULAR HUMANISM.” ANYTHING THAT GOES AGAINST THIS PROGRAM DIES ON THE VINE FROM LACK OF FUNDING AND NOTICE. THIS IS NOT A RECENT DEVELOPMENT. I EXPECT IT HAS BEEN GOING ON (SINCE MANKIND’s BEGINING). THIS SOLIPSISTIC PROCESS HAS NOT ABATED. TODAY, SCIENTISTS WHO DETECT AN INTELLIGENT FORCE AT WORK IN NATURE ARE FIRED FROM THEIR JOBS.